Kim Heldman is the bestselling author of PMP Study Guide, Third Edition and Project Management Jumpstart, Second Edition as well as Chief Information Officer for the Colorado Department of Natural Resources. William Heldman is a Microsoft Certified Systems Engineer (MCSE) and Microsoft Certified Trainer (MCT). He is a computer technology instructor at a career and technical education high school in Lakewood, Colorado. Chapter 1. Establishing Project Management Fundamentals. Chapter 2. 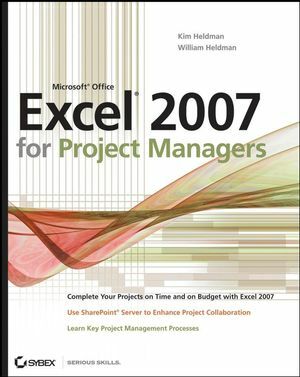 Establishing Excel and Office 2007 Share Point Server Fundamentals. Chapter 3. Initiating the Project. Chapter 4. Determining Project Requirements. Chapter 5. Planning and Acquiring Resources. Chapter 6. Assessing and Tracking Risk. Chapter 8. Constructing the Project Schedule and Budget. Chapter 9. Establishing Change Control Processes. Chapter 10. Controlling Project Outcomes and Archiving Documents. Appendix A. Excel Function Junction.